The Shredmaster GBC 7500S Strip Cut Paper Shredder is a high volume paper shredding machine with a powerful continuous-duty motor that lets you tackle high volume jobs. 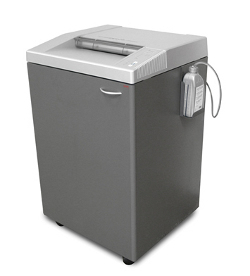 The 7500s features a 58 gallon shredder bin for fewer bag changes and has a solid one piece hardened steel cutting head and a sixteen inch wide funneled throat. The GBC 7500-S can cut up to 52 sheets at a time into 1/4" strips. The Shredmaster 7500 includes a high quality, powerful continuous-duty motor and solid one piece cutting head that easily shreds documents with staples, paper clips, credit cards, CD's and DVD's. # Features a proprietary automatic oil injections system which eliminates hands-on oiling and helps to ensure the performance and longevity of your Shredder. # Shreds up to 52 sheets at one time into 1/4" strips. Operates at a speed of 38 feet per minute for high volume shredding applications. # A 16" wide, funnel-shaped throat makes feeding all different sizes of paper easy. # Visual indicators help keep operator informed. 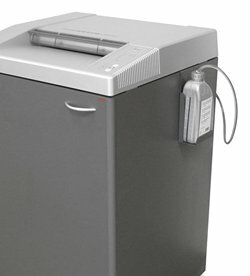 The 7500s shows you if the power is on, if the bin is full, if the door is open or if there is a paper jam. # The Shredmaster 7500 is mounted on heavy duty casters for easy mobility.